Ride Cleanup is a set of features for Premium subscribers. Why would I need to clean up my ride? There are many, many reasons you might need to tweak your ride data to make it more accurate. While we always give you the option to view just your moving time, it still is nice to be able to clean up those ride ends. 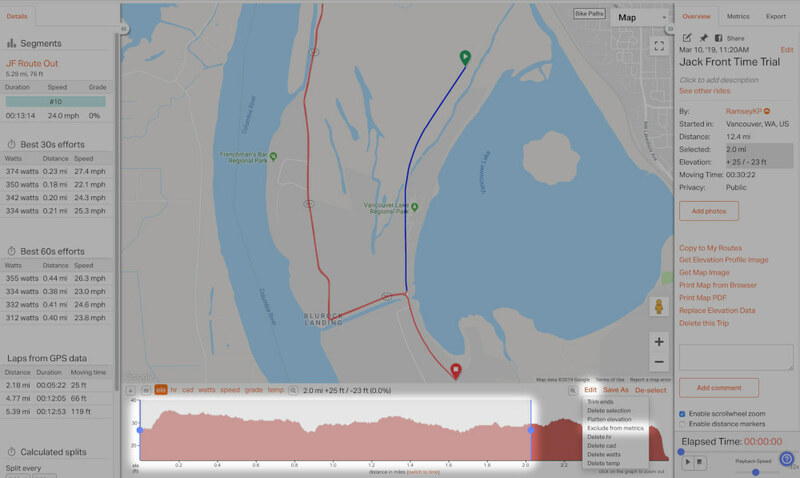 Should you experience problems with your heart rate monitor, the ride’s elevation, or your cadence data, you don’t have to choose between tossing out the whole ride and keeping all that bad data around. 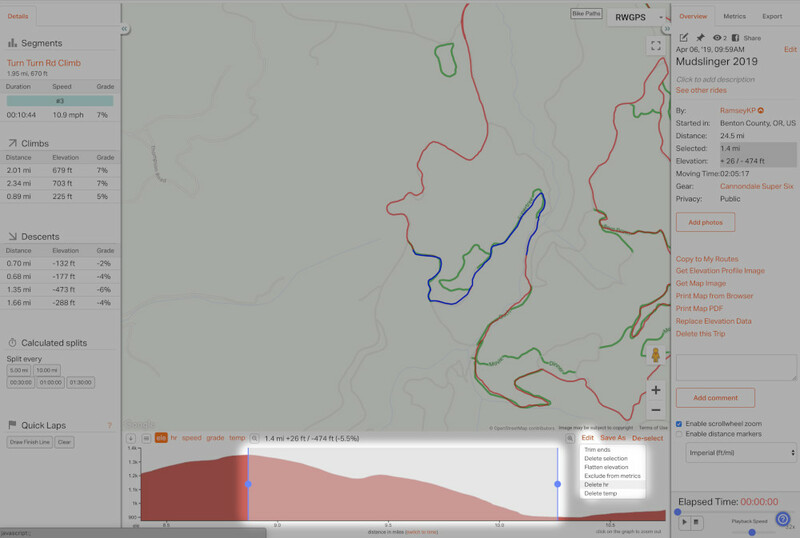 Drag over the elevation profile to select the portion of the ride to keep. Then, click Edit and select Trim Edges. This will delete everything outside of your selection. 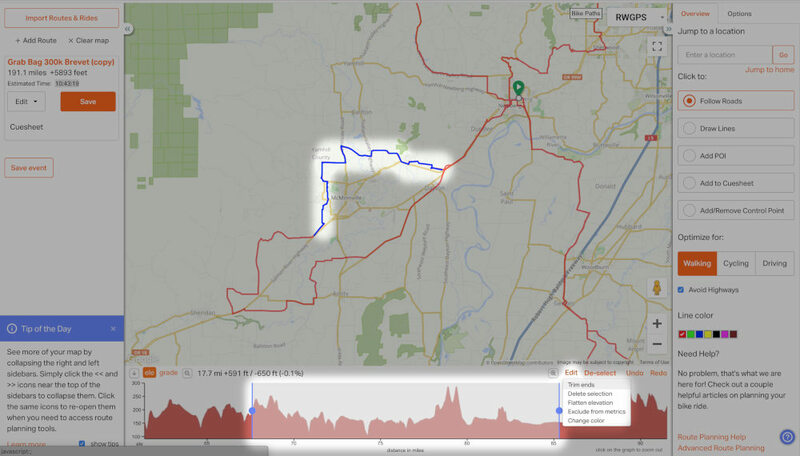 Click the Save button in the elevation profile to commit the trim to the ride or click Revert to undo the trim. After making a selection in the elevation profile, click Edit, Delete Section. This will delete what is in the selection leaving the rest of the ride intact. This is a good way to trim off the beginning or end of a ride. Please note, you can only delete a section at the beginning or end of a ride. 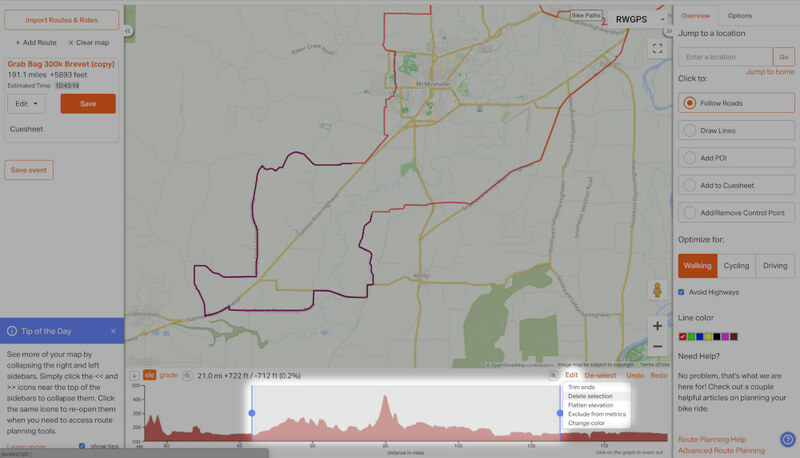 You cannot delete a section in the middle of your ride. Make a selection in the elevation profile. Click Save As, A Separate Ride in the menu and give the new ride a name. If you want to keep your original file intact, then repeat this process with the other area to create as a new ride. If you need to remove bad heart rate or cadence data, drag over the elevation profile to select the portion of your ride with the bad data. Click the Edit button, and choose the option with the data you’d like to delete. This feature is available to all account levels. 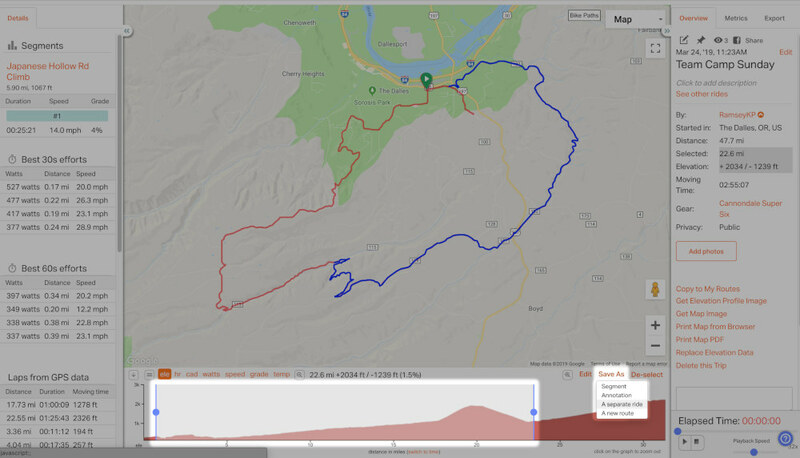 Did your ride have some weird elevation recorded by your GPS? Simply select REPLACE ELEVATION DATA in the right side menu. 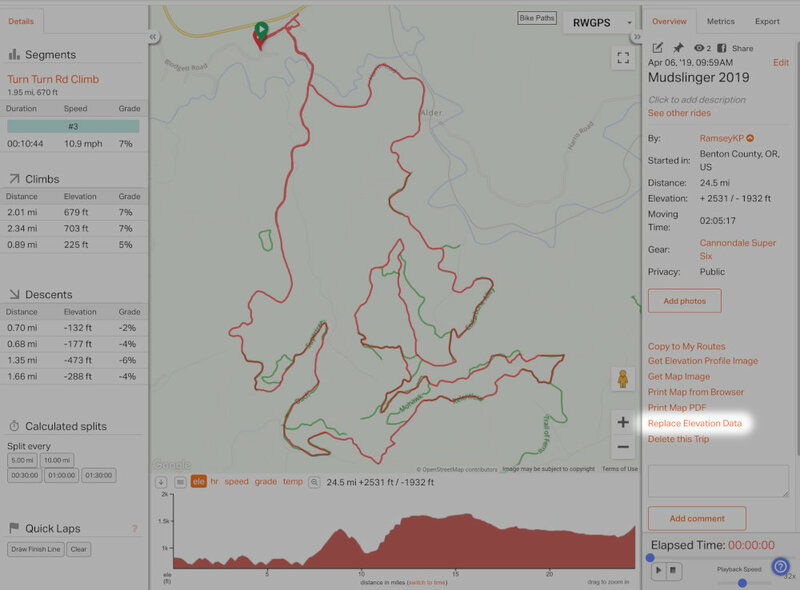 This option replaces all the elevation data for the whole ride not just a selection. This function takes a minute to replace the elevation data. 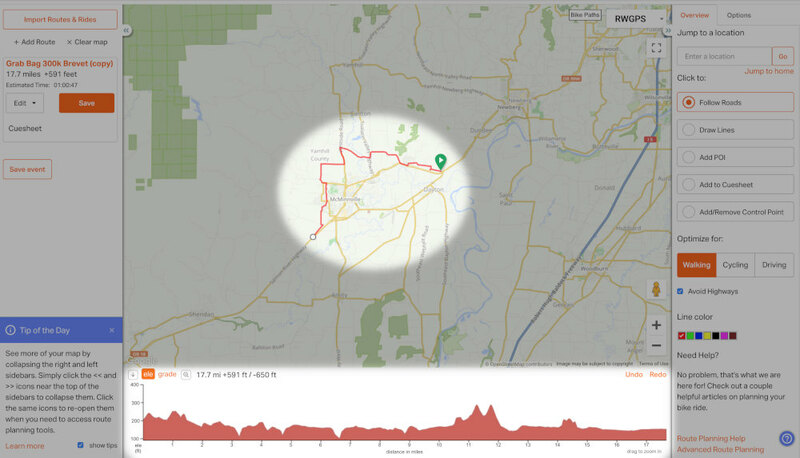 Refresh the web page to see the new elevation metrics. Available for Premium subscribers, this feature allows you exclude part of your ride but retain your track data for the total trip. Great for those times where you have to take a ferry, bus, or subway as part of your trip. Learn more about Exclude from Metrics.